Toy making is an excellent activity for the toy maker and for a great gift for kids. And free plans makes it even better. It's a great way to get kids interested in woodworking, and making wood toys can be an excellent family project. 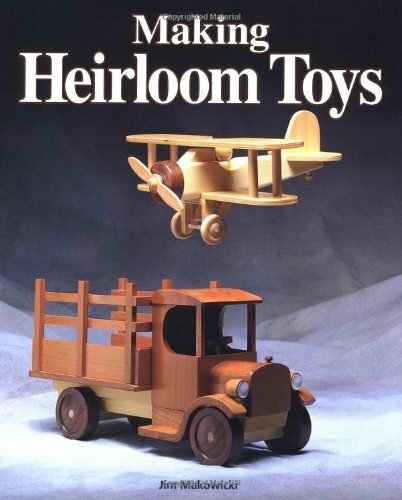 Building toys is a great way to show off your woodworking skills. Toys are something you can bring with you to let people see what your make, and they make great gifts that are enjoyed by both child and great nostalgia gifts for adults. When scaling up the drawings, try not to be overly concerned about making the templates exactly like the drawings. They are provided as a reference to help you get started. They show the proportions of the project elements and illustrate how they are assembled, but they are not set in stone. If you make changes to the design, however, do not increase the curve on the bottom of the rockers but do make the curve slightly flatter in the center of the rockers so the horse will want to sit up straight. You may wish to change the animal by cutting a different head such as a cow, a dragon, or even a Hippogriff? In this period of life their imagination is always active, they like to act and play roles of various professions. Nicely designed airplane with rotating propeller will fire up your boy`s imagination about flying and piloting. It will let him to have a good time, but also make him learn something about traffic and vehicles, also to develop his imagination and spend his energy while running around simulating plane flight and at the same time building his muscles.